Hello. I am Evan Harris. Welcome to Picky Grouchy Non-Cook! For more about how PGN-C came to be, click on the photo above (taken by my beloved husband). That's me with our stove. 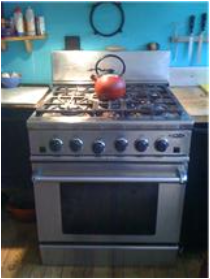 I have a prickly relationship with that stove (see below). In this photo, I was trying to clean it. Being a little weird about food is the picky part. Feeling a little harassed by food and cooking culture, and also a little harassed by the human need to eat and therefore cook, is the grouchy part. And struggling with who I am around the whole food and cooking thing is the non-cook part. Not all non-cooks are picky and grouchy, of course. In fact, many non-cooks are perfectly well adjusted, and I hope PGN-C can be a safe haven for non-cooks of all situations, attitudes, and types! At worst, I am an irresponsible, lame in the kitchen lazy bones and a non-cook apologist. At best, I am a champion of the non-cook cause. WHAT IS THE NON-COOK CAUSE? It's a good idea to be just exactly who you are and not mess around with trying to be someone you think you are supposed to be (such as, a person who can cook). There's a difference between the non-cook and the actual not cooking: one is a person, the other is a behavior. The person is in charge, not the other way around. This is the stove in my kitchen. It has been there for about ten years. It is a serious stove. It has an overbearing attitude. The reason we have such a serious stove is that my beloved husband was in charge of picking it out, and he picked out this stove because it has features. My beloved husband is a gung ho and very, very good cook, so when he says he wants features, he's talking about using them. But I will not let the presence of this serious stove intimidate me. I will not let it imply things about what I should be doing in the kitchen. The stove is not going to get the better of me with its attitude. Ditto its uncompromising stance. If I am a non-cook, it's really none of that stove's business. PLEASE CLICK ON THE PHOtO ABOVE. THANKS & SEE YOU ON THE STOVE PAGE!